Grabbing a quick few minutes while it has stopped raining and the children are jumping up and down in puddles, more like mini lakes by the amount of rain we’ve had recently lol, to update. Well I stuck to the goal of getting the two dishcloths done that I said last week. So hopefully now I’ll feel a tad more like knitting. And in just over a week the children shall be getting their school holidays so hopefully our summer will become a lot more relaxed and not so hectic and bound by the clock lol. 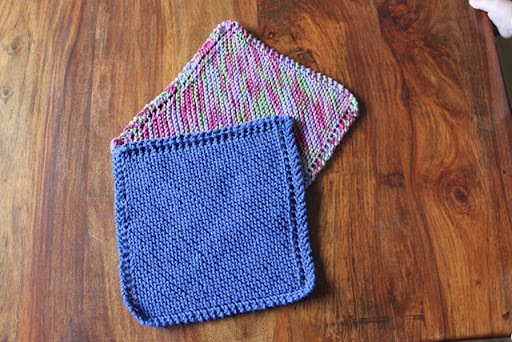 Here are the two dishcloths I knit up. This pattern is Granny’s Favourite Dishcloth and is so easy, I just cast on and knit when I get the chance, perfect really. The blue one is for Ruairí and the variegated pink/green one is for Caoimhe. This entry was posted in Uncategorized and tagged Granny's Favourite Dishcloth. Bookmark the permalink. Your term times are obviously very different to ours, is that your half term week hol, or the big summer hols? Ours start at the end of July.Nice cloths, I'm going to put some on my list this year, I reckon it would be a good way to learn some new techniques as mine are very basic.Have a good week! We used to love jumping in puddles when we were little, and running in the rain too, come to think of it. We thought it was loads of fun, but now I think it must have created a lot of laundry for Mom :)Cute dishcloths – that's my old standby pattern. It's one of the best for doing dishes! Holidays are coming :0)….. cant wait myself Ruth.Love the cloths and I'll be knitting some of them up shortly to give as a gift.Cant believe you are thinking for next year. Im definitely not that organised.CAn wait to see what you have in store though. I may have to try that pattern. Are they good scrubbers? I'll have to make sure i do not try them after trying your amazing sounding bailey's and chocolate chip cheesecake as I feel that may not go well. Agree, you just can't go wrong with the traditional corner to corner washcloth! Hope things settle in nicely for your summer. Cute simplicity, Ruth!Have a great summer w/the ohana.